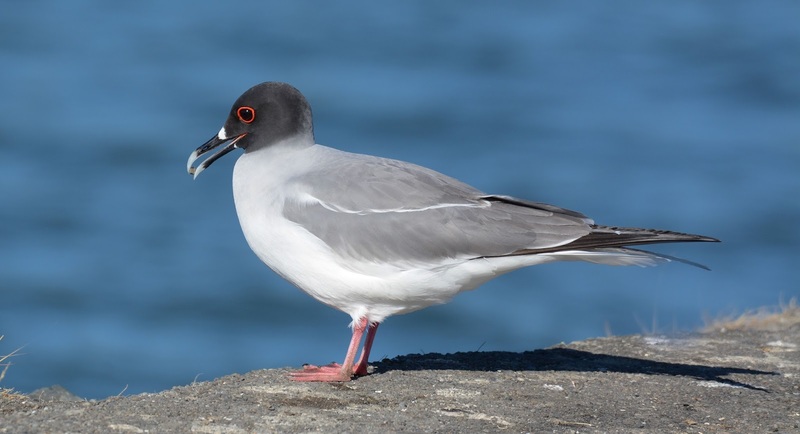 On Thursday, 31 August 2017, Ryan Merrill found an adult Swallow-tailed Gull at Carkeek Park in north Seattle, Washington (King County). 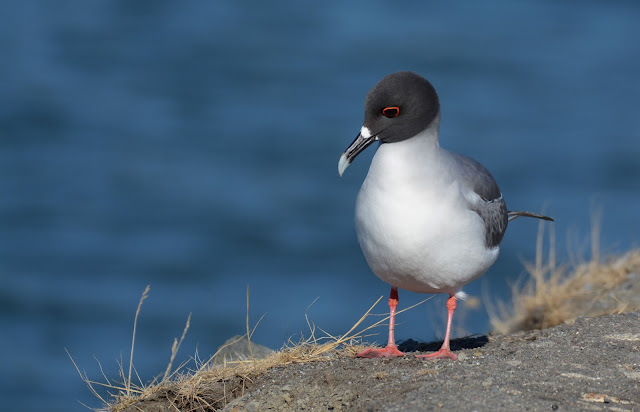 The internet went nuts and it didn't take long before dozens of birders descended on the beach to observe this rarity - only the 3rd to be recorded in North America, and certainly the farthest north the species has ever been observed. The gull spent the entire day on the beach with a flock of California Gulls, with intermittent bouts nearby in the water. It was still being seen at sunset, and surely it would be here the next morning. Or would it? I closely monitored reports for the next 24-36 hours and just about gave up on my plans when the bird wasn't found the next day. That is, until it was relocated around 5:00 pm local time, roughly 7 miles to the north at Richmond Beach, adjacent to an oil refinery. 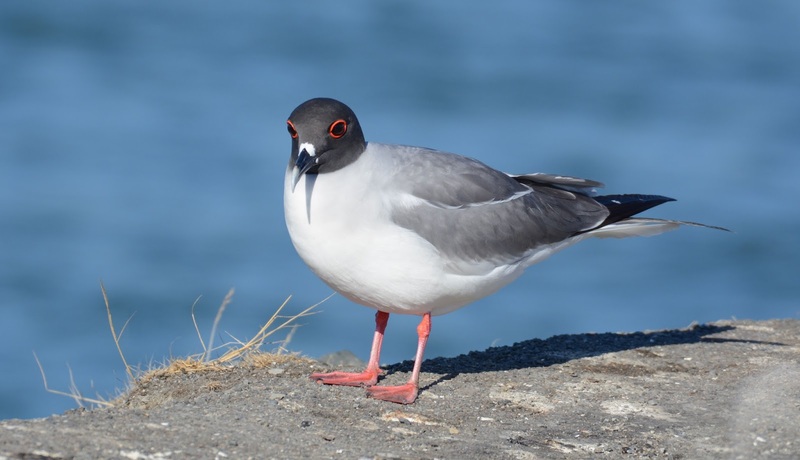 This site is a tad north of the King-Snohomish County line, putting the bird in a new county and adding excitement for local birders. I locked in with flight & rental car reservations and left Chicago at 6:00 am the next morning. I knew there was a good chance the bird wouldn't be found on the 3rd day, and I was perfectly okay taking that chance (read sweaty palms). A short 4-hour plane ride from Chicago to Seattle. When my plane landed, I received the reports every birder dreads on a twitch like this: "No bird today". All negative reports from every channel. Crap. Driving north through a more-than-ever congested Seattle on Labor Day weekend didn't ease my worries. 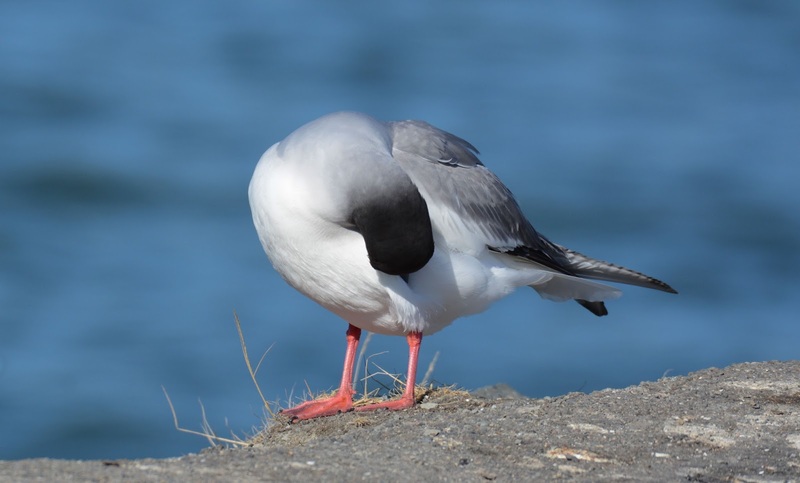 That was valuable time I could've used looking for the gull. I finally got up to Kayu Kayu Park after a 1.5 hour commute from the airport to Point wells. I walked out to the oil tanks with much anticipation. The walk from Kayu Kayu Ac Park to Point Wells is a mile, back and forth. I found no bird and no other birders here after spending nearly two hours at the refinery. After comng up empty-handed, I made the seemingly long walk back to the car. This was Seattle's hottest day of the summer, yet, 88F. As I passed Kayu Kayu from the RR tracks, I met Dave Irons who was scoping from the park proper. His wife Shawneen was resting in the car as the two had left their home at 4:00 am from Portland. We chatted for a bit and properly exchanged numbers. I drove north for about 15 minutes to check the marina in Edmonds. I spent over an hour walking around this busy site, resenting the fact so many weekend-goers were out. If the gull did have any taste for resting here, the masses of fishermen and boaters would surely drive it off. The long breakwall there was loaded with gulls and so I took a break to photograph a few Glaucous-winged x Western hybrids and briefly forgot my reason for traveling to Puget Sound. Just as it was really beginning to look bleak, I received a message from John Puschock at 4:26 pm: It's in Everett. Everett is approximately 20 miles to the north of Edmonds. 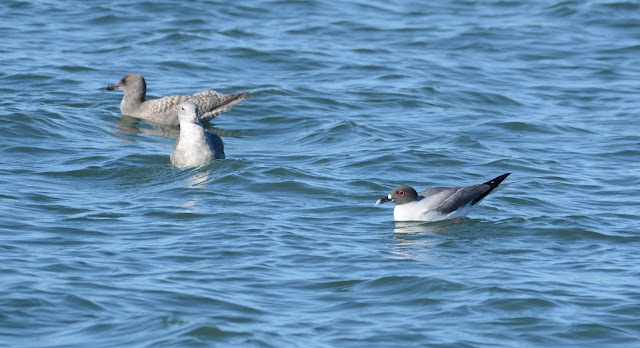 John and I were talking the night before and he was confident the bird was in the area feeding on squid. His evidence was convincing, with links to fishing reports that showed good squid fishing in the Edmonds area for the last 6 weeks. This variable shouldn't be underestimated as squid is a primary food source in this species' diet. Paying it forward, I immediately called Dave and Shawneen and alerted them. I cleared the estimated 35 minute trip up to Everett in 25 minutes. 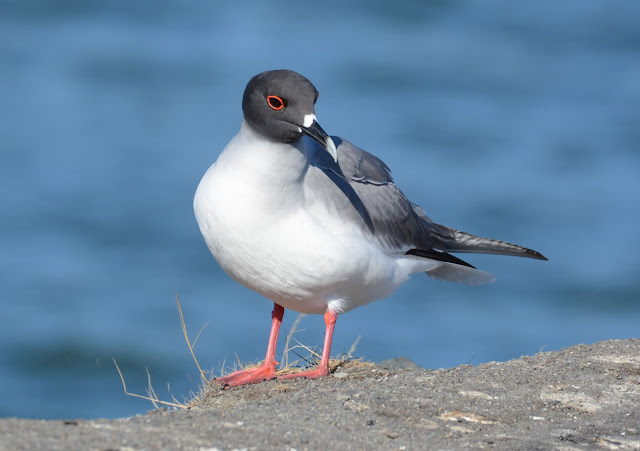 When I arrived, I found Shelley Rutkin and Philip Dickinson - two very lucky birders who spotted the gull at Everett Marina - and a couple of other birders standing with scopes and binoculars. They were looking at a group of gulls in the water. 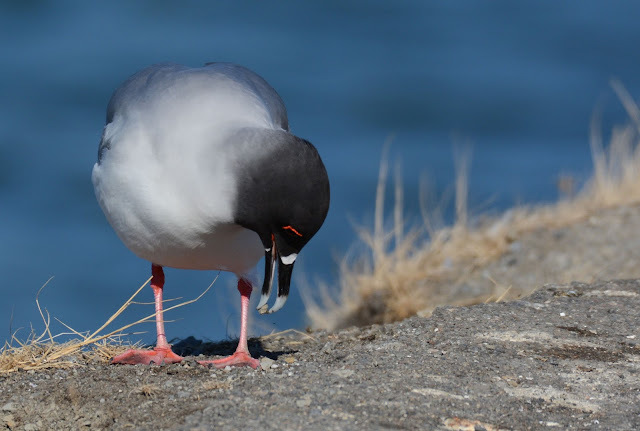 The gulls were close. Very close. I pulled up to them "drive-thru" style, raised my binoculars, and there sat the Swallow-tailed Gull about 100 feet out in the water! Lifer from the car! 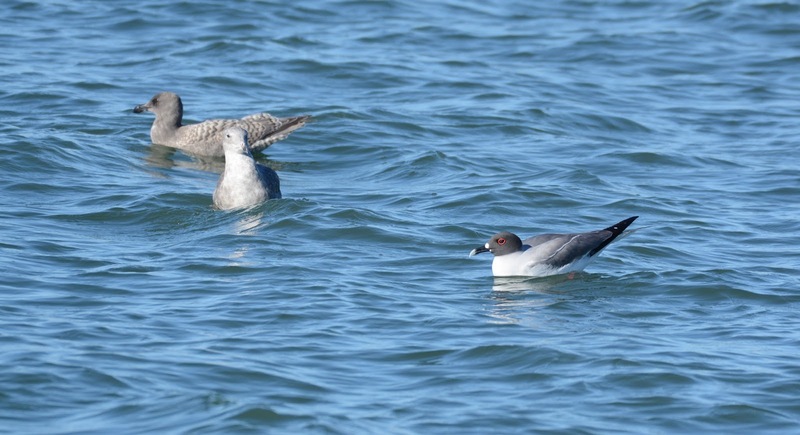 Swallow-tailed Gull with Glaucous-winged Gulls. Snohomish County, WA. 02 September 2017. Probably more than any birder I know, I've had my share of chumming in gulls (a couple of Black-tailed Gulls and several Slaty-backeds being on my A-list). But this bird was 100% "unchummed". It sat in front of us and put on the most spectacular show I could've hoped for. 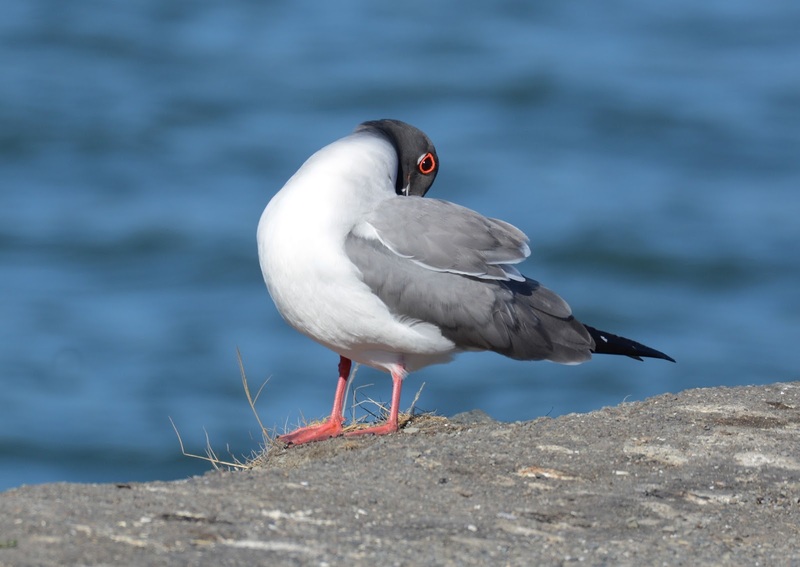 With perfect lighting and the sun to our back, it began picking up pebbles with its bill, hock-sitting, flapping its wings as if it were just learning how to use them, and occasionally winking at us as it preened. According to my camera, these magical moments lasted for a little over 7 minutes. 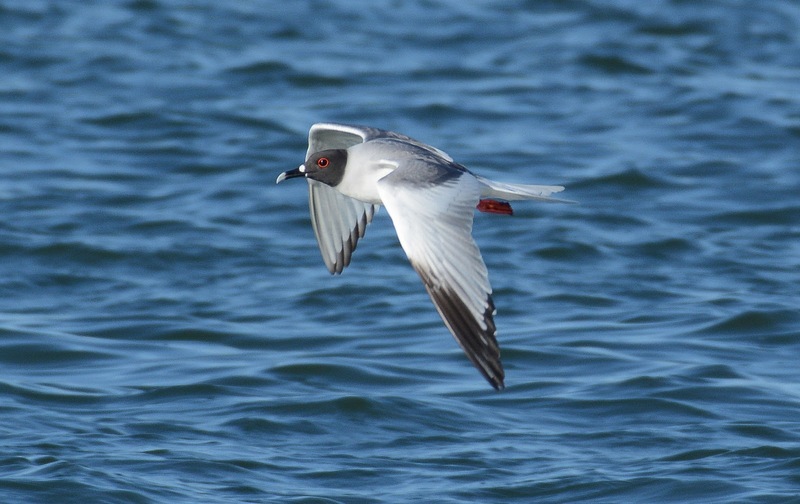 The white crescent under the red orbital is only visible when the bird squints or closes its eye. 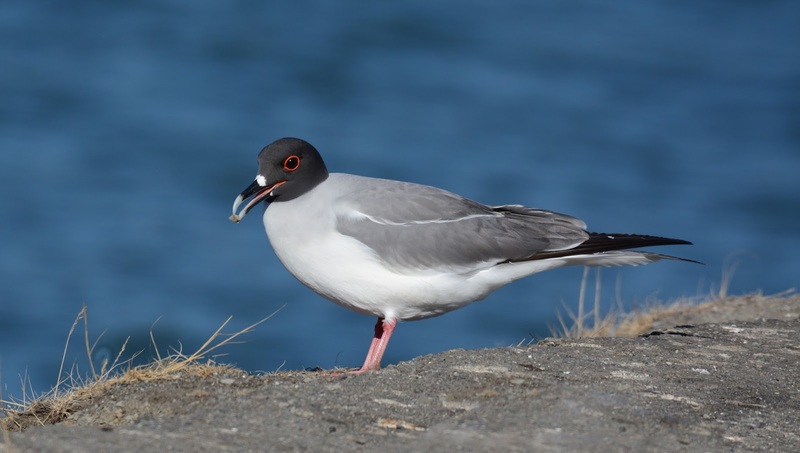 The largest eye of any gull species -- befitting for a bird completely evolved to nocturnality. 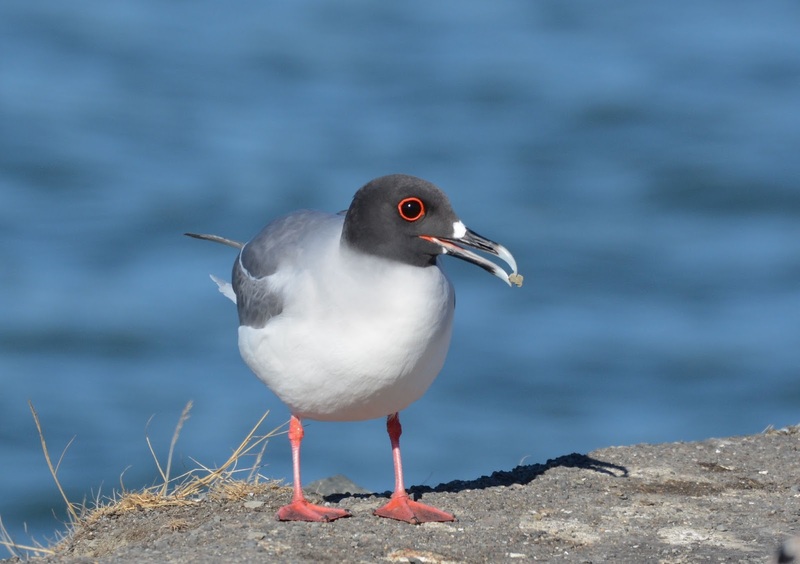 As more and more birders soon arrived, and boaters continued to pass through with their trucks and trailers, the bird wisely picked up and returned to the water. 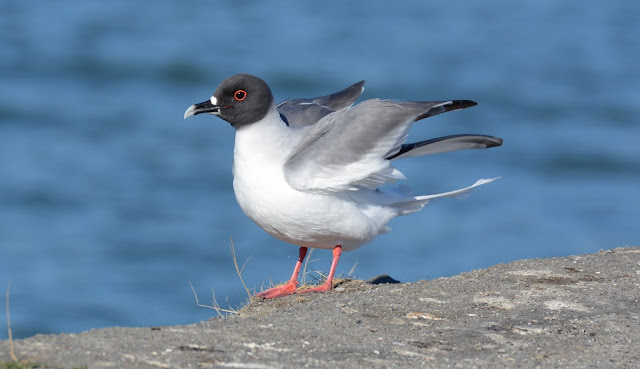 Although the upperwing pattern is reminiscent of Sabine's Gull, the black on the primary coverts is limited and never reaches the gray along the wrist. With all flight feathers intact, it isn't adjusted to a molt schedule similar to our northern larids. This should suggest it hasn't been in the northern hemisphere long. 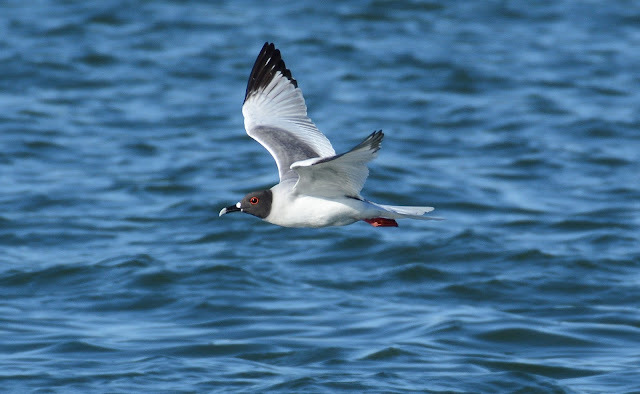 Right then as it flew off, I knew that was the closest I'd get to that gull - ever! 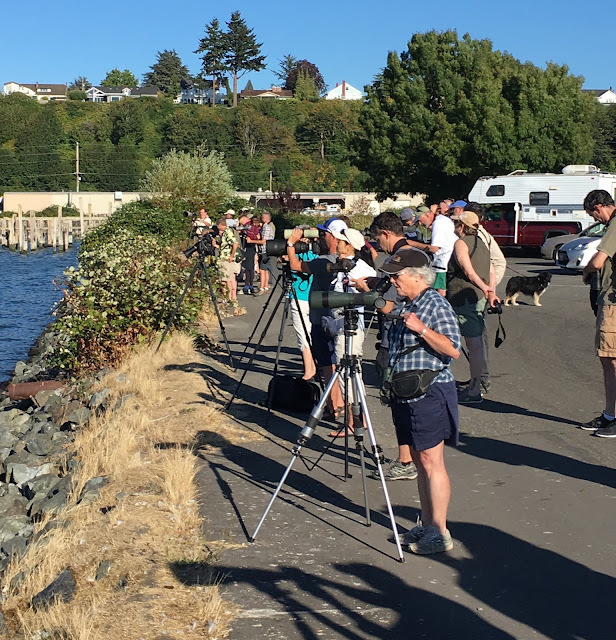 I lazily backed off and turned my attention to the growing number of birders.